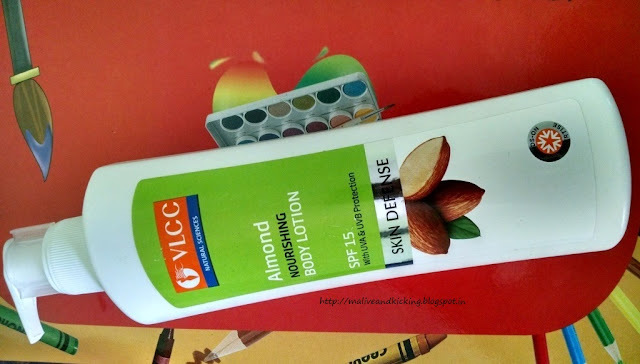 Its my first experience with one of the most loved personal care brand VLCC products. There will be a series of review posts, and I'm starting with my favourite skincare product i.e. a body lotion. 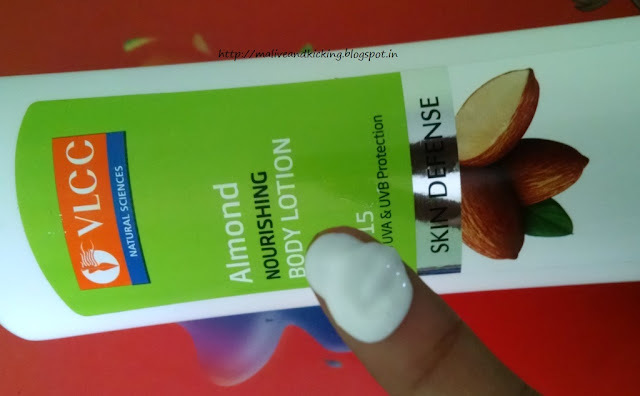 The brand sent me Almond Nourishing Body Lotion which is being reviewed in this post. VLCC has grown to become a leading wellness brand in India and abroad. From cosmetic beauty treatments, the brand has opened domains of expertise in scientific skin and hair care that tackled issues in greater depth. They have innovated to make easily available to customers, a comprehensive range of personal care products through retail channels. For supple, moisturized, youthful skin. 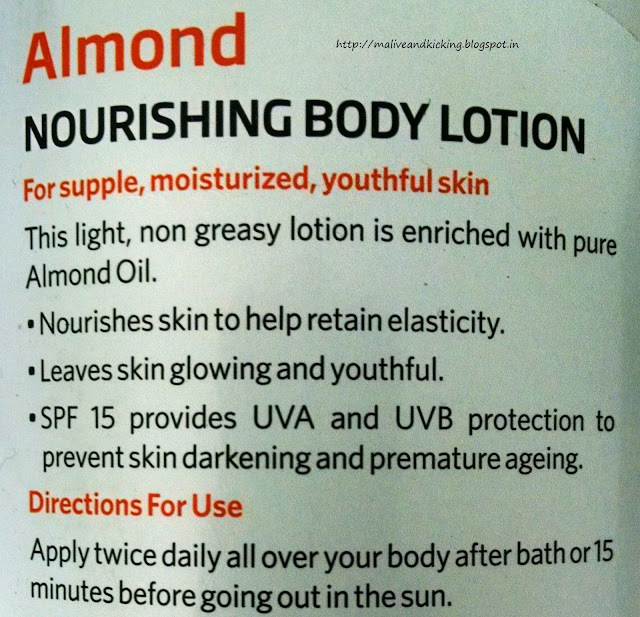 This light, non greasy lotion is enriched with pure Almond Oil. *Nourishes skin to help retain elasticity. *Leaves skin glowing and youthful. *SPF 15 provides UVA and UVB protection to prevent skin darkening and premature ageing. Apply twice daily all over your body after bath or 15 minutes before going out in the sun. Almond Oil, Wheat Germ Extract, Silicon Blend, Aloevera Extract, Fenugreek Extract, Hydrolyzed Malt Extract, Allantoin, Trehalose, Titanium Dioxide, Octyl Methoxy Cinnamate. VLCC Almond Nourishing Body Lotion is a bottled product. The long yet sleek bottle in white color is made of sturdy plastic. It has a manual hand press pump dispenser mechanism, so makes it a trouble-free packaging. One can dispense needed amount with one or two functional presses on the top. The dispenser can be locked and unlocked to avoid spillage. 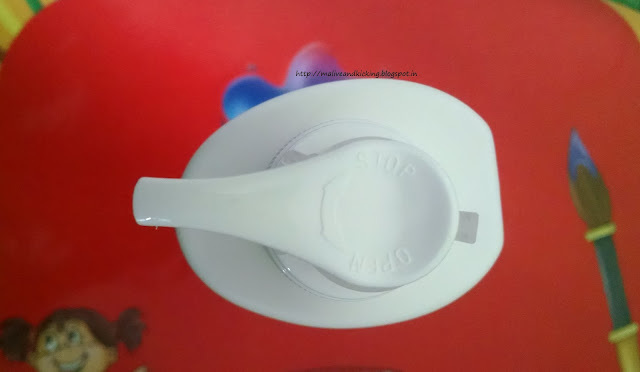 The OPEN and STOP indicators make it clear where to rotate the dispenser cap. Since its a large quantity pack, its too heavy to place in your handbag. But I don't mind transferring some quantity in a tiny bottle for my frequent usage. 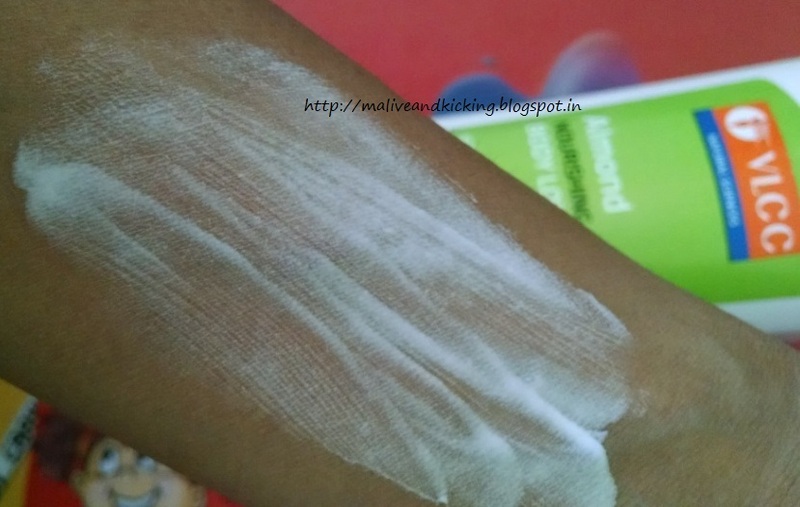 The body lotion is milky white in color and has moderate thick consistency. It won't be runny when taken on your palm, but won't even sit too thick on skin. The scent of this body lotion is a big 'turn on' for me. It smells slightly musky and bit stronger than many other body lotions I used earlier, and I feel most people will find its warm indulgent scent really delightful and sensual. The body lotion when gently rubbed into the skin, gets fully absorbed. The light texture doesn't leave behind any sheen, easily penetrates deep into the skin resulting in softening of my dry skin. Not only the lotion rich in essential fatty acids of Almond oil helps to restore moisture, but provides UVA and UVB protection since it blended SPF 15 in it. It simply means one needs not to use a separate sunscreen after applying this body lotion. I personally feel that increasing the SPF level to 30 would have protected us better against long-term skin damage. But I know its a body lotion, not the sunscreen to do that job exclusively. The light, non-greasy texture of this body lotion makes it apt to use by all skin types. Though the extra dry skin type might need a re-application, like I do apply it twice a day for a generous hydration. Overall, VLCC Almond Nourishing Body Lotion is a nice blend of potent ingredients to nourish the skin with deep benefits and is easily available at pocket friendly price. Do consider it for achieving youthful, supple skin. I have used it in winters and as I have normal skin, it suits me. Also I love its smell. I never used it before, now came to know about its qualities. Most of the VLCC skincare products work well for me. Glad to see another effective one. 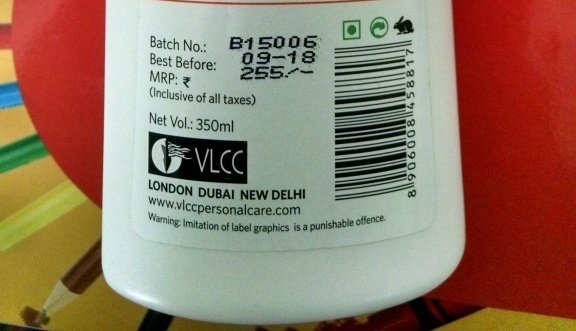 Im Never trying a VLCC Product bt after ur review looking forward to use.